Being aware of the early signs of hypoglycemia will allow you to treat your low blood glucose levels quickly - in order to bring them back into the normal range. It is also recommended to make close friends and family aware of the signs of hypoglycemia in case you fail to recognise the symptoms. Who is at risk of hypos? If you are not sure whether your diabetes medication can cause hypos, read the patient information leaflet that comes with each of your medications or ask your doctor. It is important to know whether your diabetes medication puts you at risk of hypos. Whilst medication is the main factor involved in hypoglycemia within people with diabetes, a number of other factors can increase the risk of hypos occurring. You can take steps to minimise the risk of these factors causing hypos. Hypoglycemia is when blood glucose levels fall below 4 mmol/L (72mg/dL). Hypoglycemia in relation to diabetes is often abbreviated and referred to as a hypo. Hypos are more likely to occur for people taking insulin or a type of tablets called sulfonylureas. It is advisable to treat a hypo as soon as you recognise the symptoms. Diabetes UK recommend that you treat a hypo by taking 15-20g of a short-acting carbohydrate. If your next meal is not due, follow the short acting carbohydrate with some longer acting carbs such as a slice or bread or a portion of fruit. It is recommended to re-test your blood sugar after 15 to 20 minutes and re-treat if your sugar levels are still less than 4 mmol/L (72mg/dL). If someone experiencing hypoglycemia is unconscious, the NHS advises that they are put into the recovery position and either given glucagon or an ambulance called. If no-one has been trained to give glucagon, an ambulance should be called. Hypoglycemia is detected by measuring blood sugar levels with a glucose meter. Any blood glucose level below 4.0 mmol/L indicates that the individual has hypoglycemia. Urine tests do not detect hypoglycemia. If taking a blood test is not possible or would take too much time, it may be better to treat the hypo straight away. How do I treat hypoglycemia? Hypoglycemic episodes can range from mild to severe. 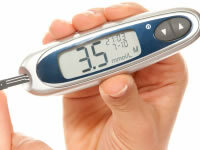 Mild hypoglycemia can usually be treated by the individual and are to be expected to some degree in people on insulin. Mild hypos are not associated with significant long term health problems unless they are occurring very regularly or for long periods of time. Severe hypoglycemia, however, will require treatment from someone else and may require an ambulance. Severe hypos can lead to immediate danger if not treated immediately. Whilst rare, severe hypos can potentially lead to coma and death. What is dead in bed syndrome? Do symptoms always occur before hypoglycemia? Most people experience some warnings before the onset of hypoglycemia. However, some diabetics may experience little or no warning before the onset of sudden or severe hypoglycemia. An impaired ability to spot the signs of hypoglycemia is known as loss of hypo awareness (or hypo unawareness). The key to preventing hypos is understanding why hypos occur and then taking actions to stop this happening. If you know that a hypo is likely to occur soon, carbohydrate can be taken to raise sugar levels and prevent the hypo. If your doctor is happy for you to adjust your medication doses, you can also lower your dose during or following certain activities (eg exercise or after having alcohol) to prevent a hypo occurring. Testing blood sugar levels regularly can help you to understand when your sugar levels are dropping too low. Your diabetes health team can help you with making changes to your diabetes management.